The height of summer is here and with it comes an abundance of herbs from both cultivated plots or gardens and the wild spaces that surround us. This is the peak of the harvesting season, with intense new growth all around. Carry on harvesting leaves like mint, oregano, rosemary, thyme, savoury, basil, parsley, coriander, chervil, fennel and bay, and flowers like calendula, chamomile, st. john's wort and lavender. marshmallow has started flowering, so now is the perfect time to harvest the flowers and young leaves. Borage is also in full bloom! Add the flowers to salads, decorate cakes, or use them to make the prettiest ice cubes ever. Lemon balm's aromatic properties are a lot less noticeable once it starts flowering. Depending on how hard you have been harvesting from your plant, it might have already flowered or will start flowering anytime now. Once it starts, stop harvesting and let it do its thing. The wildlife around you will be grateful. This is also a time of abundance in the wild: mallow continues to flower, and some of our summer favourites have come into season, including yarrow, mugwort and meadowsweet. Nettle seeds will soon be ripe and ready for picking too. Eat them fresh as a nutritious snack, add them to food, or dry for later use. Incorporate as many fresh herbs as possible into your food. Make herbal drinks like cordials, ice teas, or even herbal ice lollies. If you have plenty to harvest from, keep some for later in the year. Drying is a simple way to preserve herbs, that then can be used in teas, in cooking, or in the making of other herbal preparations. A great idea we will try this summer is nettle seed salt: harvest the seeds as soon as they look ripe, lay them on a piece of fabric or tissue paper and place in an airy cupboard to dry for a couple of days, mix the seeds with an equal amount of sea salt, and voila, you've got an extremely nutritious addition to table salt. If you prefer fine salt, just put the mix in a blender and pulse a few times to break it down to a finer texture. Trim established perennial plants like lovage and sage after they have flowered. Pruning plants after flowering helps to maintain an attractive shape and encourages lots of new growth. Keep an eye out for any signs of disease or pest damage. It is much easier to help your plants recover when these things are noticed early on. A couple of potential troublemakers to watch out for are aphids on a variety of plants; celery leaf miner on parsley, celery and lovage; and rosemary beetles on rosemary, lavender and sage. Watering is very important in the summer: not only does the soil dry out quicker, but the plants also require extra moisture to sustain all new growth they have been putting on. Without enough water, plants get stressed and therefore more prone to bolting, diseases and pest attacks, so make sure to keep your plants hydrated. This is even more important when it comes to plants in pots or containers, that can dry out in a matter of hours on a sunny summer day. An easy way to ensure your potted plants have access to enough water to keep them going is to place them in a dish or tray filled with water, so they soak it up from below. There is still time to sow annual herbs now and enjoy them this season. Go for fast growing plants like basil, dill, coriander, nasturtium and borage, and you should have a nice harvesting window before the first frost hits in autumn. Now it is also a great time to sow hardy biennials like parsley and chervil. Direct sow in a sheltered spot to get a supply of fresh leaves during the winter months. July is peak harvest time... all the work we’ve put into the garden this year is beginning to show and we’re enjoying the beauty and abundance of nature. In what areas of your life have you put a lot of thought, time and effort into this year? Are there any particular relationships, jobs or parts of yourself you have been working hard on? Where can you now harvest the fruits by taking a step back and acknowledging how far you’ve come and what you’ve learnt? June is a pretty magical time of the year, the days are really long, plants grow at an astounding rate and there's an explosion of colour as flowers of the most diverse shapes and shades come into season. Plants in the mint family like lemon balm, oregano, and all types of mint can be harvested pretty hard and will quickly grow back, so don't be afraid to do it regularly. Lavender has started flowering and the first blossoms should be ready to harvest soon, so keep an eye out. The best time to harvest lavender is when about 75% of the flowers on the blooms are open. Keep on harvesting pot marigold and chamomile flowers regularly. The more flowers you remove, the more the plant will produce. Harvest the unripe seeds of sweet cicely. They are delicious in teas, cold infusions, or simply as a refreshing treat to chew on. st. john's wort is traditionally picked around St John's day on 24th June, so look out for those precious yellow flowers towards the end of the month. Another medicinal flower that should be ready to harvest from mid June is linden, also known as limeflower. The linden tree is considered sacred and an important icon in the mythology and folklore of many cultures. The flowers have an array of health benefits and are widely used in herbalism. Other lovely flowers to harvest in June are rose, lady’s mantle and honeysuckle. Feverfew is also in full bloom at the moment. Although the part used is actually the leaf, it is best harvested when the plants are flowering. Try to never take more than one third of the plant at a time, so it can recover and stay healthy. And don't forget you can use your weeds! Now it is a good time to collect plantain leaves, blackberry leaves, horsetail, and mallow flowering tops. Nettles have started flowering, so it's no longer a good idea to consume the leaves, but we will soon be able to harvest the seeds. Use the abundance of wonderful plants growing at the moment in food, fresh teas, cold infusions, herb vinegars and other herb extracts, and dry some for use later in the year when there's less fresh stuff around. Now that the weather has warmed up, it's a great time to make sun-infused oils. Why not try infusing pot marigold or st john's wort flowers in oil for use in balms and other skin products? Simply put the flowers in a jar, cover with your oil of choice, and leave it on a sunny windowsill for four weeks to infuse. Now it is the perfect time to take softwood cuttings of perennial herbs, like mint, lemon balm, thyme, rosemary, sage, oregano and lemon verbena. It is also a great time to cut back chive plants. Once they have finished flowering, cut back to about an inch above the soil level, keep them watered and they’ll bounce back with tender new shoots. Make sure your plants have enough water throughout the warm season, especially those growing in pots, where the soil dries out much quicker. The best time to water is early morning or late afternoon when the plants are not in direct sun. Put a bowl of fresh water out in your garden to serve as a birdbath and supply drinking water for birds and insects. This can help our little wild friends cope with the heat of the summer days. If last year you grew plants that self-seed easily, some areas of your garden or pots might be a bit overcrowded at the moment. Transplant some of the plants to another location or pot them on to give to friends. And in the same way that the plants we want to harvest are putting on a lot of new growth, so are all sorts of other weeds. Keep on top of them to avoid overcrowding and competition for water and nutrients in your pots and herb beds. Sow annual and/or fast growing herbs like basil, shiso, dill, summer savoury, parsley and coriander. Coriander tends to bolt quickly when grown this time of the year, but although you get a short harvest window for the leaves, the flowers and seeds that follow are also great! There's also still time to sow seeds for edible and medicinal flowers like borage, pot marigold, zinnia, viola, sunflowers and nasturtiums. Lots of new, colourful, abundant growth is coming through this month, what can be celebrated in your life? What joys do you have? Bigger ones and smaller everyday ones? Could there be something new to take joy in? Noticing the smell of fresh blossom on your way to work? Spotting the elderflower in bloom from the train? We have sown seeds for the last few months and now know what has germinated and what didn’t do so well. Are there any areas of your life, work or relationships that have healthy shoots of new growth and areas that aren’t growing in the way you’d hoped? Just naming and knowing what these are can be really supportive to shifting them later in the season if change is needed. Some herbs, like calendula and chamomile, have better harvests the more attention you give them. Are there any small acts of self care you can do to support your growth? Think tiny and do-able. Drink more water as the weather heats up? Reach for your toes regularly to stretch out your legs and back? Turn your phone off for an afternoon? Tell yourself ‘I’m doing a wonderful job at this...’ each day for a week? June is a month of fast growth but also the time plants are settling, finding their roots and getting established. What would it be like to stop, feel your feet on the earth and take a deep breath at some point this month? Written by Hackney Herbal trainee Amy. The blossoming of the Elder tree (Sambucus nigra) marks the beginning of summer. Elder's sweet white flowers come into bloom from late May and bring with them the promise of sunshine, long, warm evenings, abundance and harvest. Having been used for centuries, elderflower has a rich history in folklore and is still used by herbalists, foragers and plant lovers today. For us, making Elderflower cordial from this sacred tree is a celebration of all that has been in the dark of winter and all the warmth and light summer promises. Native to the British Isles, Elderflower was once called The Queen of Herbs and The Elder Mother. It was said to be polite to ask her permission before cutting the tree down and was often hung above doors and planted around homes for protection. Traditionally all parts of the tree were used, from making furniture and dying clothes to treating inflammation, sickness, arthritis, insect bites and grief. It is said the famous physician Boerhaave didn't pass an Elder tree without tipping his hat to its many healing properties! Modern herbalists use its flowers in summer for hay fever and the berries in autumn and winter as protection against colds and flu and to support immunity (recipes to come!). The elder is a wonderful example of a plant that supports us with different properties as the seasons change and we become susceptible to different illnesses. For the next few weeks, a delicious aromatic cordial can be made from these beautiful flowers. It is easy to make and foraging for it along London's canals, parks and green spaces is an opportunity to notice the abundance of wilderness and nature around us. Pick the flower head in the morning on a dry day (preferably from higher up the tree where no animal or human has got to it!). Forage sustainably by only taking a small amount from each tree so there’s enough flowers to turn into berries in autumn and remember to ask its permission first! Happy and responsible foraging and let us know how you go on facebook and instagram. Enjoy this delicious sweet cordial with ice, water or added to cocktails! Words and images Amy Birtles. A wonderful wild herb that is abundant during the early spring. Sometimes a bit tricky to pick if you haven’t come prepared with long rubber gloves, but well worth the stings. Bursting with vitamins A & C, iron, potassium, manganese and calcium nettle makes for an excellent brew. Try it as a detoxing herbal infusion or add it into soups and stews (which takes away the sting) for an iron rich boost. It's also a good infusion to try for your skin and can be used to remedy the symptoms of acne and eczema. Nettle grows wild so you can forage for it in woodlands, hedgerows and other people's gardens! Always pick the fresh leaves at the tip of healthy looking plants. Always remember to check the foraging guidelines for picking plants in public and private space. You can use nettle to make a clarifying hair rinse to remove product build up in your hair, nourish your scalp and condition your hair. It's also suitable for itchy and irritated scalps and those with sensitive skin. It's very easy to grow marigolds from seed. They grow happily outdoors either in a pot or in the ground and can also be grown indoors in a sunny spot next to a window. You can sow seeds outdoors in March or if you are keen to get going you can start them off indoors in February. They are an annual plant - completing their life cycle in one year - and they drop plenty of seeds allowing new plants to grow in the next season. You can also collect some of the seeds at the end of summer to sow again the following year. We mainly use our calendula to make an infused oil, the basis for all our herbal cosmetics. The flowers are rich in anti-oxidants (flavanoids) and these have a wonderful affect on protecting and restoring the skin. It is known as a vulnerary agent meaning it is useful for the healing of wounds. Calendula oil is very gentle and can be used to make creams and lotions to treat all sorts of skin complaints like eczema, stings and bites, psoriasis, scarring, stretch marks and nappy rash. Follow the guide below to make your oil which can be used directly on the skin or incorporated into another recipe. 3. Pack the dried flowers loosely into a jam jar and cover with oil - sunflower, olive and almond oil all work well (about 15g herb to 100ml oil). 5. Strain out the flowers and store oil in a cool, dark place. If you don't have a sunny windowsill you can also infuse your oil by placing herbs and oil in heat proof bowl set over simmering water. Heat for 30 minutes then leave to stand for 1 hour. Never let the oil boil. 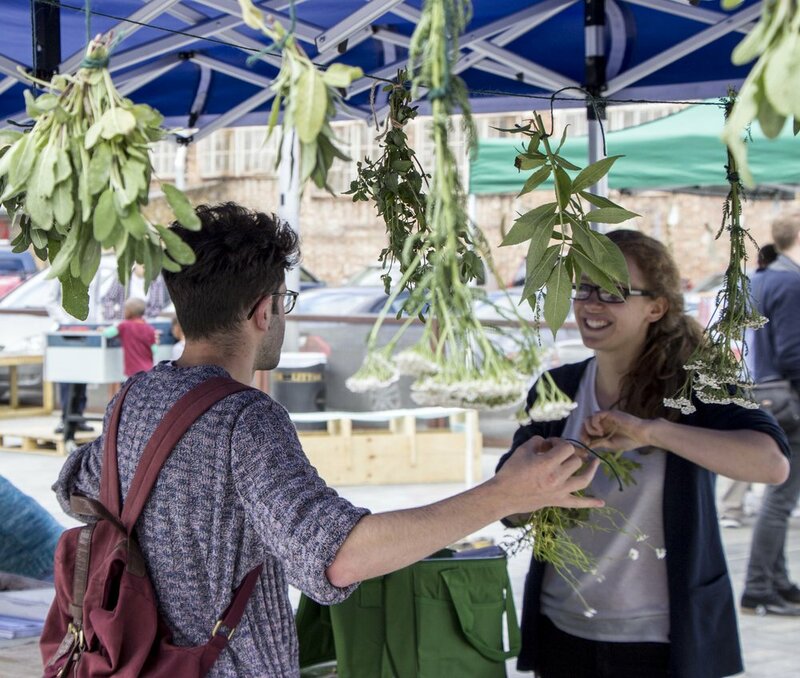 We are recruiting two herbal trainees to join our team at Hackney Herbal. This is a great opportunity for someone who wants to gain experience of working in the community / urban food growing sector and gain skills relating to running a social enterprise. Download the full application pack here. It's too early to be sowing seeds outdoors but Thai Basil is something that you can sow indoors every month of the year. So it's great for those of us with an itch to get sowing again. It's also a great herb for people without gardens because it will actually be much happier basking in the sun of a cosy sheltered windowsill than being outdoors against the perils of the English climate. Its fragrant leaves can also offer a good defence against flies and other indoor insect pests. You'll find seeds online if not at your local garden shop. It is delicious raw in salads or can be added to stews, soups, curries and stir-fries. You might have added it to your phở (noodle soup) if you've been to a Vietnamese restaurant. If you can't grow it have a look for it in your local Asian supermarket. It slight aniseed scent makes a refreshing sweet tea (fresh or dried) and can be infused in sugar to make a syrup for drinks. Blend the ingredients in a food processor until smooth and serve with a squeeze of lime for a citrus twist. Vegans can substitute the parmesan for a vegan cheese or leave it out, it still tastes great! It's prime time herb harvesting at this point in the summer, so we thought we'd share with you some tips on harvesting and drying flowers. For a lot of herbs we cut the flowers from the plants without their stems, which means you can't hang them up to dry! So instead, we lay out flowers on drying racks or well ventilated surfaces. Read on for a guide on how to do this and some of our top tips. 2. Select the best looking flowers. Avoid ones that are already fading or have been eaten by insects. 3. Use sharp garden scissors or secateurs to remove flowers. Remember to prune back to a leaf on plants like roses and marigolds to keep them tidy and promote more flowers. 4. While you harvest you can also deadhead flowers that have gone over and remove tarnished leaves to keep your plants in check. Compost these bits. 5. Once harvested, spread the flowers out on your drying surface. Ensure that they are nicely spread to allow good airflow to the flowers. It's ok if they overlap a bit, just avoid them being piled up on top of each other. 6. Dry away from direct sunlight as this will deteriorate the flowers and encourage volatile oils (which hold a lot of herbal goodness) to evaporate and be lost. 7. Check on your flowers every few days and gently turn them to ensure air is reaching all parts of the leaves. You know that the flowers are ready if they crumble easily. If you are drying flowers or herbs for the first time it's a good idea to experiment with different areas in your home to find where the driest and best ventilated areas are! Once they are dry you can store them in an airtight container, in a cupboard where there is no chance of them being in contact with moisture. Brown paper bags inside airtight containers or recycled jam jars work well. Psst. If you need some help with growing herbs or want to get started come along to our next workshop, City Gardening: Growing your own herbs on Thursday 27th July at the Bee Garden in Dalston.